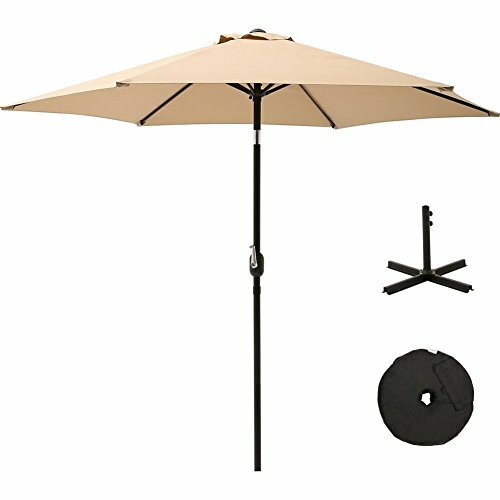 With the perfect crank and tilt mechanism, you can open and close the umbrella smoothly, adjust your umbrella to get a comfortable shade area. With no muscle and no sweat, it is easy to set up. The 9 FT umbrella protects you from blinding sunlight and UV rays. It is ideal for both commercial and leisure purposes. You can enjoy your leisure time by having a coffee with your lover or friends, holding a party around the swimming pool. Air vent at the top facilitates wind circulation and keeps the umbrella stable. When not in use, or in bad weather, we recommend that you close and cover umbrella with protective cover (not included) to ensure a long-lasting use.